A sale of over 700 original artworks by students, alumni and staff from The University of Northampton's School of The Arts opens on Monday 10 December at the University's Avenue Campus Gallery. The popular 15x15x£15 event - now in its tenth year - features a varied selection of work in a wide range of media and styles, all measuring no more than 15cm in any dimension and offered for sale at £15 each. A £100 prize is awarded by the gallery committee to the best entry by a current student. This year the competition has received 712 entries, almost twice as many as previous years. The exhibition organisers have undertaken to show all work that has been submitted and are currently busy getting the gallery ready for the opening event which is taking place on Monday 10th December from 5-8pm. 15x15x£15 2012 opens at Avenue Gallery at The University of Northampton's Avenue Campus on St George's Avenue on Monday 10 December, when it will be launched with an open evening from 5-8pm. The exhibition will then be open daily from 10am-4pm until Friday 14 December. Admission is free. 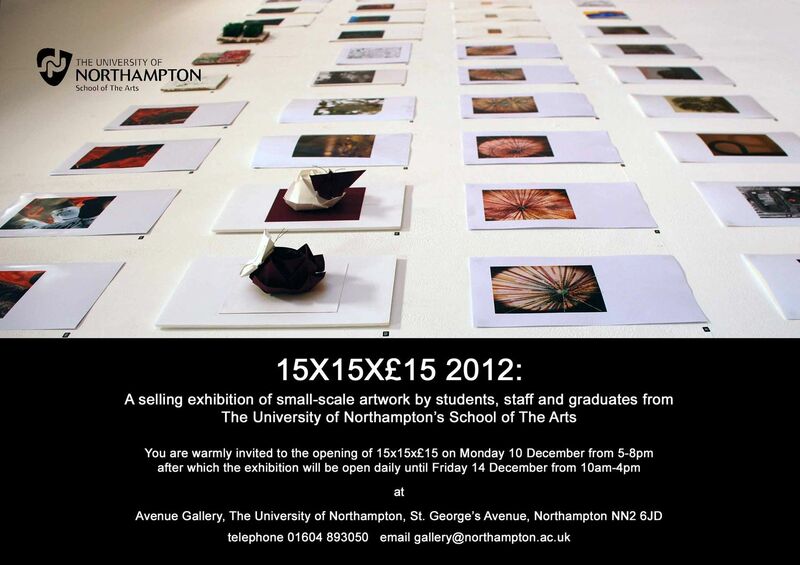 For more information please contact the Gallery on 01604 893050 or email gallery@northampton.ac.uk.